Sankeien, in Yokohama, has been mentioned here before, but as I continue to label my photos from when I was in Japan, I continue to be amazed at the history of some of the buildings and objects Hara Sankei obtained for his garden. Yes, many of the buildings are among the oldest in the Kanto, and they're nice, and look good, and some contain paintings by big name painters such as Kanô Tan'yû. But that's not it! 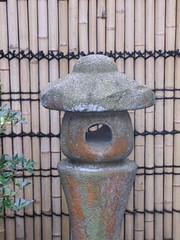 This stone lantern supposedly saved the life of Sen no Rikyû, when Hideyoshi sent men to kill him. He ducked behind the lantern, which took the swordstroke for him. Of course, he was killed in the end, but it's still a pretty cool artifact, if the story's true. 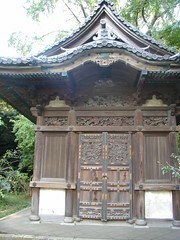 The Jutô Ôidô of the former Tenzui-ji was built as a mausoleum for Hideyoshi's mother. I was surprised to see that such a major and historical structure would be allowed to just be purchased and moved like that. Can you imagine anyone buying and removing anyone's mausoleum for their garden, let alone one belonging to (a relative of) someone so famous? There's also a teahouse which may have built for one of Nobunaga's brothers, one built by Ieyasu for Fushimi Castle, a stone washbasin which may have been a pillar of Kyoto's Gojô-Ôhashi, and a wall painting which may have once belonged to Byôdô-in. It's not quite Ryôma's grave, the remains of Honnô-ji, or any of the dozens of other super major samurai history sites I haven't been to in Kyoto, but, for the Kantô, it's definitely something, I think. And a very nice garden in general; a nice escape from the modernity and urbanness of Yokohama. It IS something, thank you for posting these pictures and interesting information. It is surprising that such an artifact was purchased and moved but it is also very good to see it preserved and open for others to see. It may not be Ryoma's grave but I think these finds are equally meaningful to visit as well. I have visited Ieyasu's grave in Nikko many times but I would like to find some more obscure historical sites in the Tochigi area as well. I will have to do some research on that.